Discussion in 'The Lounge' started by N8 v2.0, Sep 14, 2005. We've been itching to let the veil off of her for about a week now to see what you think. 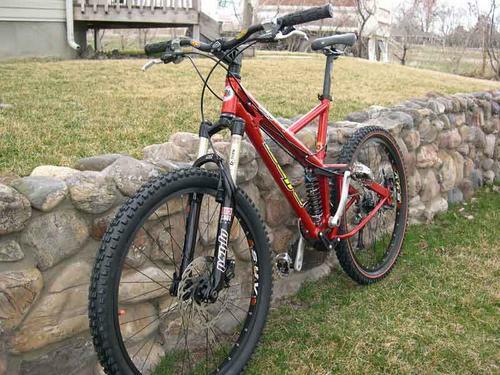 This is a 6 inch travel AllMountain bike. We're not sure the market is ready yet for such a long travel bike, but we wanted to see what was possible. Because of the bent seat tube, we were able to keep the chainstays to 460mm. The ultimate angle of the seat tube above the pivot was determined by using a vitual placement of the seat (adjusted per size) and making the effective seat tube angle 73 degrees. Obviously, this angle will change slightly depending on the seat height. I've been prototyping this frame as a 26 inch wheel for about a year now, and refining it before converting it over to a 29er. As she sits (without pedals) she is 30.2 pounds. This includes some new heavy duty 29er rims from WTB. We would love to hear your comments and look forward to you posts. It looks like it got hucked by Bender once or twice, then some one put a white brothers fork on it. its not VPP.... VPP has opposing moving links. it looks like a Balfa 2step sure hope it rides better then one. why the 2Step hate? Plenty of people love the way the 2Step rides. N8 I think this is your most useful post in the Lounge to date. where did you find the info on that thing? Niner bikes seems like one helluva smart and upcoming company. 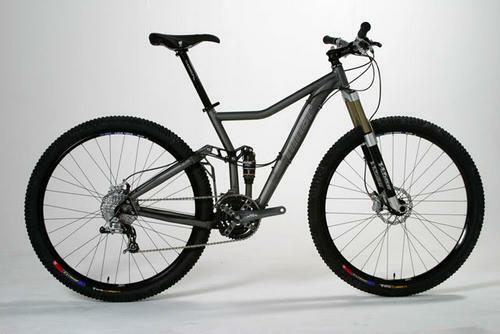 Have you seen their steel 29er the SIR 9 yet? Looks killer! That bike is goregeous. Never been a fan of 29'ers, but that is really nice. 30 pounds, yikes that's on the portly side, even for an "all mountain" bike. 30 heavy for a 6" bike? could be wrong, but it looks like if you were to run 2 rings and a bash guard the lower swing link would be hitting rocks and such...I guess you could always just run a big bash guard. Either way, sweet lookin bike. Nice. I glad to see more 29" options are coming out everyday. I'm thinking I'll get a 29'er for my next bike. Probably a 29'er racer-x with a reba fork, at this point. Availibility is kind of depending on you. This can be availible as early as Dec/Jan, but we weren't sure what the reaction would be for a 6" travel bike, so we were planning on pushing it out a little further. Here's a pic of the chainstay clearance with a 2.3 Exi. There's plenty of room for even bigger tires (hopefully a few will come along). The derailleur right now is an E-Type derailleur. It's the best way I've found getting around the bent seat tube. Unfortunatly, because of the angle, a derailleur can not be mounted to the actual seat tube, so I designed the bike to use the e-type. Honestly, I think it works great. The only issue is they are harder to find. Not every bike store carries them. Sizing and pricing are still TBD. Since this frame has a bent top tube to add stand over, we can make the seat tube longer, so, as Cloxxki stated, there won't be a mile of seat post putting an undo amount of stress on the top tube/seat tube junction. This will also allow for more seat tube adjustment, since it will bottom out where the bend is. 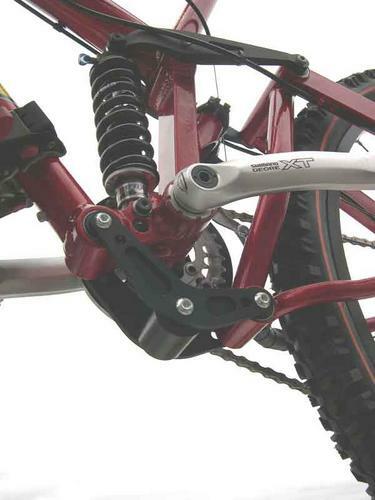 The frame weight, with rear shock is a little over 7 pounds for the medium. It has replaceable drop outs (both left and right, I'm still experimenting with a Rock Shox MAXLE rear system that they're offering for 06, replaceable left and right side drop outs allow me to offer an upgrade to this thru axle set up). It seems like there is some good excitement. If we find out that there's enough interest (and by interest we mean people willing to plunk down some cash), we can put the frame on the fast track for development. It still has to go through cycle testing and a full shakedown to make sure it's ready for prime time. Do you ride at Camp Robbie? My Talas switchblade(5.7") is 28 pounds with a minute 1:00/Crossmax enduro/X.9/tubless tires (blue groove/Roll-x). I have a slight weight penalty because I use the Raceface Atlas cranks, which are on the heavy side, if I changed tires and cranks I could hit right around 26 pounds. At 7 for the frame, plus a few hundred grams for the larger wheels and tires it should build out to something close to 30 pounds with the same components as my switchblade. I think you could hit 27 pounds with some good component choices. will nokian make a 3" gazzy in 29"? I think DHS hit the nail on the head with his observation that this Niner looks a lot like a 2Step FR. Looks like a refined version of the Balfa linkage design to me. Man would I love to try out one of their test bikes! may i have, or buy the proto niner 26inch version?